Biggey has been home for the weekend. She’s been lovely. Who would know, if you saw her these last two days, what had been going on these last few weeks. Our family are torn apart by trauma. This is the effect of adoption breakdown, disruption, lack of understanding, poor support, trauma, neglect, abuse and learning difficulties. She’s been going wild, completely uncontrollable, running away, staying out with ‘friends’ all night, abusive and violent. One person said she’s feral. She’s now suspended again from school and this time I don’t think the school will have her back. The FC can’t cope and has been asking for more support and better intervention since November and still nothing. I know how she feels. I reckon the FC is going to insist on moving her too. The authority are supposed to be looking at a special needs residential school. Finally! We asked for this before the breakdown even happened; then again in August, September, December ….. There aren’t many of these types of schools in the country, they could be absolutely anywhere and even if they find one, they will need to do an assessment of Biggey to ensure they can actually accommodate her, her needs and that she will fit with the children they already have. That’s a big ask. The LA are dragging their feet – probably because it costs a lot of money. and of course, the one we all wait for …………. have you tried sticker charts? She’s 14!!! She has had 5 Foster Care placements in 7 months and missed so much school she’s 2 years behind. She didn’t like staying out all night, she was cold and bored but daren’t say no in case her ‘friend’ dumped her. The school don’t want her because she has a statement. There are worse kids there, just they don’t want to help her. She’s sick of people sitting around talking about her like she’s not there (at review meetings). It makes her feel useless, rubbish and that no-one wants her. She wants to come home, she misses us, she misses someone caring and listening to her but she’s worried she’ll keep exploding and ruin everything. She really wishes her SW would stop asking her if she wants to see her birth parents, it frightens her, they are not safe, they hurt her and she thinks the SW will tell them where she is. Well, that’s a sad set of statements and all completely understandable. Whilst I don’t agree with the way she is behaving and responding I can totally see the reason she is doing it – it’s textbook responses. I’ll push you away before you push me away. I’ll destroy this before you take it away. If you think I’m rubbish I’ll show you that. I daren’t bring her back home because the Social Workers are likely to leave us to cope with the mess of her trauma, along with Littley. I don’t want her wandering the streets at night, she’s a prime target for exploitation. I don’t want her to be moved again, and then again to a residential if they find one. What a bloody mess. No doubt I’ll be awake through another night and then spend most of tomorrow on the phone. Littley has a horrid cold, sore throat and temperature. She thinks she’s going to die because she’s poorly so that brings its own tantrums and challenges caused by fear and flashbacks to early life reminders. The good news is that as she’s older I can get some adult medicine down her which seems to numb things for a few hours before it all kicks off again! She was off school on Friday and is not going to get there tomorrow. That will bring more issue when school talk to her about her attendance – that’ll be the least of our worries! I think the saying “stuck between the devil and the deep blue sea” was made for a situation like yours. So sorry you find yourself in this position. Hope it gets resolved soon. A great post – thank you. Yes! Absolutely. She’s drowning and I’m firing up the flames I think! I too hope we sort something soon. All too familiar situation for parents of traumatised adopted teens. Thats why a few of us set up Potato. We can’t change this overnight but are doing our best to support adopters via Potato. 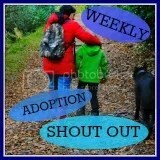 Take a look at our website Parentingadoptedteens.org.uk. We can offer robust peer support. Thanks Kim. That’s so helpful and kind of you.